I struggle with trying to find healthy food options for breakfast and snack time. When I'm hungry, quick and easy is the best. I'm particularly fond of smoothies, but I don't often make them because either I don't have all the ingredients needed or I'm feeling too lazy to locate them and put them all in the blender. Recently, thanks to MyBlogSpark, I had the opportunity to try out Yoplait Frozen Smoothies. This smoothie mix is found in the freezer section of the grocery store. The smoothie package contains Yoplait frozen yogurt chips and frozen fruit -- everything needed to make your own fruit smoothie, with the exception of milk. All that you need to do is dump the contents into your blender and add milk (the package says to use skim, but I used 2% because that is what we had on hand.) It only takes a couple of minutes to make a delicious drink. The mix comes in four different flavors: Blueberry Pomegranate, Triple Berry, Strawberry Banana, and Strawberry Mango Pineapple. One package makes two servings and each serving contains only 110 to 120 calories. 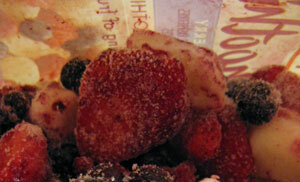 We tried out the Triple Berry flavor containing strawberries, blueberries and raspberries, and I was pleasantly surprised when I opened the package and noticed the large frozen real fruit chunks. Instead of adding 1 cup of milk, we added a little more to make a thinner smoothie that the kids would be able to drink with a straw. I like my smoothies thicker so next time I'll follow the package directions. It only took a minute for the blender to mix up the batch, and we had a nice, frothy cold drink to enjoy. It's an easy, peasy, no fuss way to a yummy smoothie. The smoothie tasted as good as anything I've made from scratch, and I love that it contains calcium and live and active yogurt cultures. My son loved his "shake." Unfortunately my daughter was less excited about it because it contains seeds. Someday soon I hope she'll get over her seeds in food issue! I plan to keep a few packages on hand for when I'm craving a light and cold fruit-filled snack. Even though MyBlogSpark sent along an awesome 3-speed KitchenAid® Blender to use, we decided to use our own, not-as-fancy blender to review the product and will donate the lovely new KitchenAid to a charity. I'm sure a deserving family will really appreciate receiving it during the holidays. Follow Yoplait on twitter or facebook for all the latest information and click on the widget below for coupons and more information. Yoplait wants you make your holidays a little brighter and has offered to giveaway a gift pack to a Brimful Curiosities reader. This awesome prize pack includes two VIP coupons to try Yoplait Frozen Smoothies and a 3-speed KitchenAid® blender with a special smoothie setting. To enter, leave a comment relevant to this post. Have you tried the Yoplait Frozen Smoothies? What flavor do you think sounds good? • Contest ends on Monday, December 6th, 2010 at 11:59 PM CST. 3rd extra entry: Blog about this contest then post your link in the comment section. 4th extra entry: Follow me on twitter (iambrimful) and tweet about the contest. 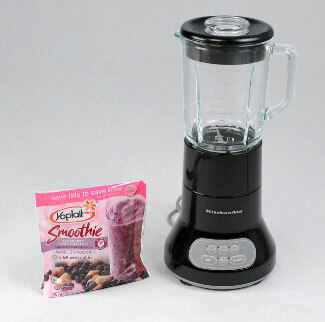 "Win a KitchenAid Blender and Yoplait Smoothies Prize Pack - Giveaway Ends 12/6 @iambrimful http://bit.ly/eYFs5Z"
I have not tried these smoothies yet, but the triple berry sounds yummy. I have not tried the smoothies yet but the triple Berry sounds yummy to me. I have tried the Triple Berry flavor and liked it. I'm a follower via GFC. I have not yet tried these, but I'd love to! I have not tried them but think the triple berry would be good. I haven't tried these yet. I didn't know about them until today- the Strawberry Mango Pineapple sounds delish! I haven't tried the Yoplait frozen smoothies yet. I would like to try the strawberry banana. I've tried and simply love the Triple Berry. I haven't tried this, but we drink a lot of smoothies and I think my kids would love the strawberry banana. I love smoothies but never make them--too much work, too many ingredients. Would love to try this! I follow/subscribe to Brimful Curiosities on my Google Reader! love the mixed berry flavor I sampled at costco. I tried straw-pineapple I added vodka it was yummy!!!!! I haven't tried these, but I will look for them. We love smoothies! Blueberry Pomegranate sounds delicious! I follow Yoplait on twitter as ptowngirl. I have not tried these smoothies yet but I would like to try the Blueberry Pomegranate. I haven't tried these yet, but they look great! Especially the triple berry! I haven't tried any of the smoothies yet, but Strawberry Mango Pineapple sounds yummy. l'm going to look for these, and try the bluebetty pomegranate, sounds delish! I want to try strawberry banana! l'm following you on twitter, too! I haven't tried the Yoplait Frozen Smoothies but I am sure I'd love it because I love their other products. Thanks! Following your blog with google friend connect! I haven't tried them, but the blueberry pommegranite looks really good. I have not tried the Yoplait smoothies. I think the Blueberry Pomegranate sounds good. I haven't tried the smoothies, but oh my they look delicious. I am a e-mail subscriber. I would love to try the Strawberry Mango Pineapple. I tried the Triple Berry and it's DIVINE! I have yet to try this product. The Berry would be the first one I would try. It does really look good. I have tried the Yoplait smoothies and love the Triple Berry. I would also love the blender because my current blenders doesn't do a good job making the smoothies. I haven't tried them yet, but would love to try the Triple Berry! I haven't tried these yet, but I would love to get the Strawberry Banana flavor. Yum! I have tried Strawberry Banana but would love to try Triple Berry these are so easy to make and taste so good! We make smoothies everyday for lunch. But, my berries are getting low from summer picking. This is a great prize! I have tried these. They are nice and creamy. I like the triple berry the best. I follow Yoplait on twitter @Aerated. I have never tried this before! I'd like to try the Strawberry Mango Pineapple! Thanks! I absolutely love smoothies and I'm dying to try the Yoplait smoothies, specifically the strawberry banana flavor but I have one small problem..I don't have a blender. I haven't tried these yet, but the strawberry banana flavor sounds great! I follow your blog on GFC! Would love to try these. Haven't yet, the Triple Berry sounds good. Yes, I have tried them and I love them. The blueberry/pomegranite is my favorite. Thanks. I have not tried them all and would love to try the strawberry magoe pineapple! i love the yoplait smoothies, triple berry i my favorite flavor! I have not tried Yoplait Smoothies yet but they sound perfect for me. I would like to try the Triple Berry flavor. I want to try the Strawberry Banana. I Follow me on twitter (iambrimful) and tweet about the contest. I haven't tried these yet, but the Strawberry Banana sounds tempting! I haven't tried them because we don't have a blender. mango pineapple will blow your hair back! I want to try the strawberry banana flavor. 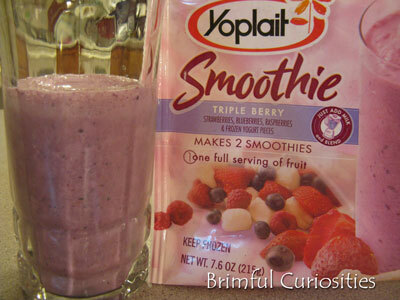 I have not tried the Yoplait Smoothies yet, but I really want to try the Triple Berry. Thank you for the lovely giveaway. I have had this (Costco) but only the berry flavor. Very good smoothies, I use Almond Milk in mine. I have not tried the smoothies yet, but I am going to try them all. I have not yet had these. I would like to try Blueberry Pomegranate. Thanks. Triple Berry sounds so good but we havent tried any of these yet,. Nope, not yet. I'm excited to try the Strawberry/Banana. I love to try the Strawberry Banana flavor. I have not tried these yet, but would love to try the blueberry pomegranite variety. I haven't had these yet but strawberry banana sounds good to me! I haven't tried the Yoplait Frozen Smoothies. But, when I do, I would love to try the Blueberry Pomegranate flavor. I am an e mail subscriber. Following Yoplait on Twitter surromama2 and Facebook! Yum! I've not had these yet, but I will be searching for the Strawberry Mango Pineapple next time I go shopping! Sounds fantastic! I haven't tried them yet, I would love the strawberry banana flavor, thanks! I would like to try the triple berry. The strawberry banana is great, though! I used to make my own smoothies in the morning, but it was too much hassle. These yoplait kits make it easy. I haven't tried them yet but Strawberry Banana sounds really good! 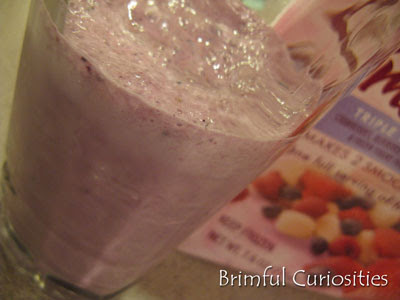 Thanks for the giveaway...would like to try the Yoplait Blueberry Pomegranate smoothie ! i haven't tried it yet, but Blueberry Pomegranate sounds good. I haven't tried them yet, but you can bet this weekend I'll be searching out the Triple Berry. I love Smoothies, but I never have made one at home. I haven't tried them yet but would love to try the Strawberry/Banana. I haven't had the opportunity to try the Yoplait Frozen Smoothies but would love to try the Strawberry Mango Pineapple flavor. Wordful Wednesday - "The Last Apple"
Out looking at books - Back Soon!